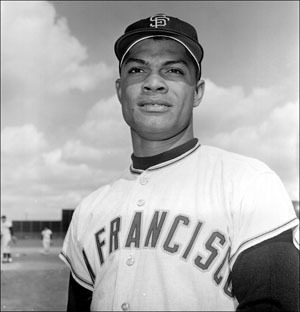 Felipe Rojas Alou was born on May 12th, 1935 in San Cristobal, Dominican Republic. He is a pioneer in the sense that although he is not the first Dominican player to get to the majors, he is the first to play on a regular basis. The six foot right hand hitter, was the oldest of the famous Alou brothers, who all had fine MLB careers. As a child living in poverty, he dreamed of one day being a doctor to escape, but it was his athletic ability that would make him a success. 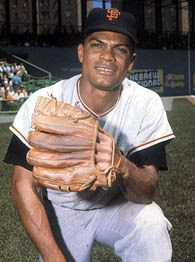 Felipe was originally signed by the New York Giants in 1955 7 got to the big leagues three years later, as the team was now relocated in San Francisco. by 1961 he was the teams main right fielder, playing alongside Willie Mays & behind another Hall o Famer, Willie McCovey who was the team's first baseman. That season his younger brother Matty was also a member of the Giants outfield. Matty would play for the Giants from 1960-1965. 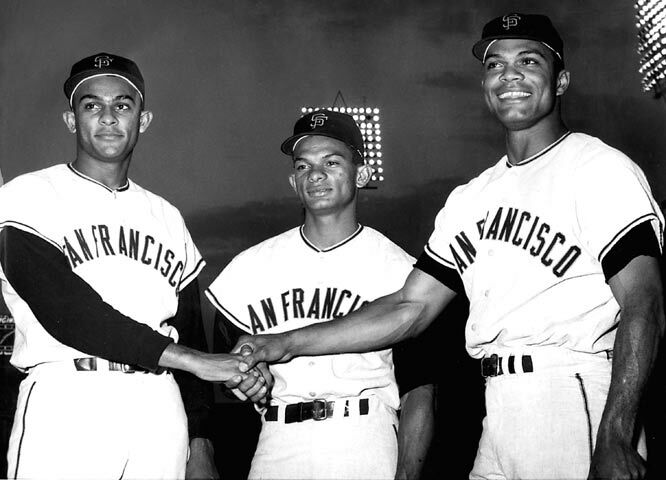 In a historic game in 1963 all three Alou brothers would line up the Giants outfield & be in the line up. In 1962 Alou hit .316 (7th in the NL) his first .300 season, as manager Alvin Dark used the versatile Alou all over his lineup. He answered with 30 doubles (7th in the NL) 25 HRs & a career high 98 RBIs, making his first All Star game. That season the Giants won the NL pennant, beating out the rival Los Angeles Dodgers in a best of three playoff series. The Giants rallied in the top of the 9th inning after being down 4-2, with a four run inning. Matty Alou led off with a base hit & Felipe Alou himself drew a walk. Both brothers scored, with Felipe scoring the winning run, after Stan Williams walked Jim Davenport with the bases loaded. An insurance run scored as future Met, Larry Burright made an error at second base on a Jose Pagan grounder. In the World Series he hit safely in five of the seven games batting .259. In 1963 he was involved in a big trade with the Milwaukee Braves, going to Milwaukee with Ed Bailey & Billy Hoeft in exchange for Del Crandall, & future Mets Bob Hendley & Bob Shaw. As a Brave he would play with Hall of Fame team mates Hank Aaron & Eddie Mathews, as well as Joe Torre, Rico Carty & eventually Orlando Cepeda. 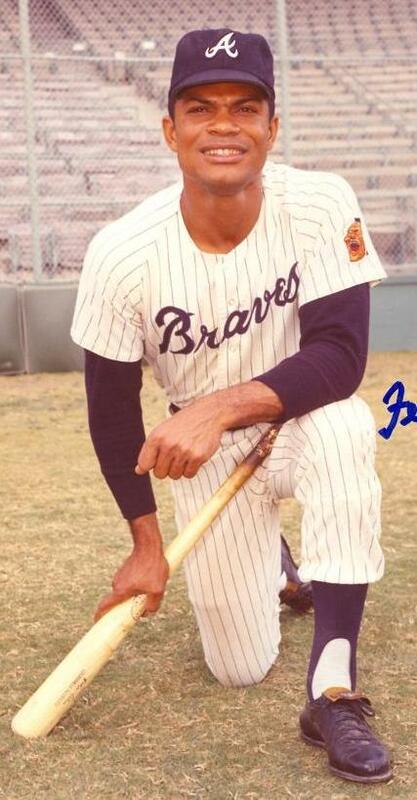 In 1966 the Braves franchise moved to Atlanta & it was there Felipe would have his best years. In 1966 he led the league in hits (218) runs scored (122) & at bats (666) while batting .327 runner up in the batting race. He hit .274 the next season & followed with a huge 1968 campaign, as he made his last All Star game appearance. He would hit .317 (third best in the NL) Leading the league in hits (210) at bats (668) & plate appearances (718). He hit 11 HRs with 57 RBIs & 72 runs scored as his numbers began to decline from this point. 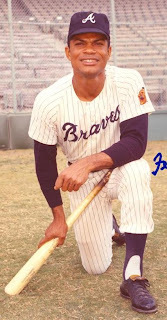 His last season in Atlanta was in the 1969 season, as the club won the NL Western Title. In the first NLCS played, he went just 0-1 appearing as a pinch hitter against Nolan Ryan in Game#3. Alou would play in Oakland with the A's (1970-1971) then go to the AL New York club in their dark days of 1972-1973. He then played with the Montreal Expos (1973) & Milwaukee Brewers (1974). In his 17 year career, he batted .286 with 2101 hits 359 doubles 49 triples 206 HRs 852 RBIs 107 stolen bases 985 runs scored & a .328 on base %. In the outfield he played1531 games at all three positions making 322 assists posting a .986 fielding %, making just 96 errors in 1586 innings. Retirement: After his playing career he began a long career with the Montreal Expos in 1976. At first a minor league batting coach soon promoted to manager. He eventually got to the big league Expos team & made to bench coach in 1991. By 1992 he was promoted to the teams manager, replacing Tom Runnels, becoming the first Dominican born MLB manager. Alou would become the most successful manager in Expos history taking the club to a first place finish & three second place finishes as well. In 1993 his Expos won 94 games but finished second to the Philadelphia Phillies by three games. 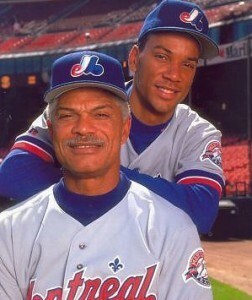 In 1994 with his son Moises Alou as the clubs hitting star along with Cliff Floyd, Larry Walker & Pedro Martinez, the Expos were riding high in first place. Unfortunately the players strike ended the season & no post season games were played. In 1996 the club finished second for the last time, before falling to four straight fourth place finishes. After the 2001 season he was let go by owner Jeffrey Loria who would move the franchise to Florida. Alou retired & did not want to return, but gave in to be bench coach of the Detroit Tigers. 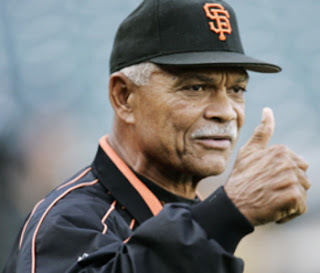 In 2003 he moved on to manage the San Francisco Giants, replacing Dusty Baker who had gotten the club to the seventh game of the World Series the previous year. It was that year Alou's team won 100 games, a career high, finishing in first place. But he lost to his former boss Loria & the Florida Marlins in the playoffs. In 2004 the Giants finished in second place with another 90 plus win season (91). In 2005 his son Moises joined him for the second time as a team mate in his managerial career. 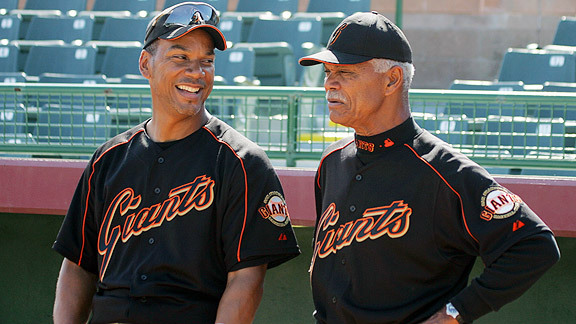 In 2006 Alou was Barry Bonds manager, as the controversial player kind of broke Hank Aarons all time HR mark. 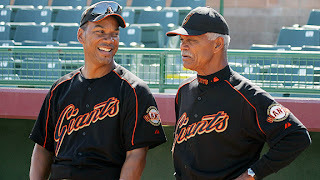 That was Alou's last season as manger. In his managerial career he is 1033-1021 (.503) in ten seasons over 2055 games.